Designed by Boeing, the Douglas X-3 Stiletto was an experimental jet aircraft built to investigate how aircraft features affect supersonic speed. Known for its tapered nose (a characteristic unusual for aircraft at the time), the Stiletto was the first to incorporate titanium into its construction. 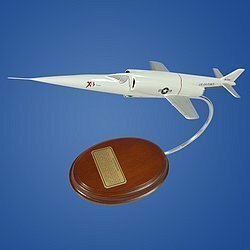 Unfortunately, the X-3 Stiletto never achieved its target speed due to problems in engine development. However, it contributed to the future development of high-speed aircraft. It made its first test flight in 1952 at Edwards Air Force Base in California, and has now retired and found its home in the US Air Force Museum.